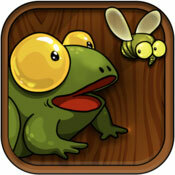 Eat Them All – Frog Adventure is presented to us by Egor Piskunov. It is a user-friendly, playful app that is perfect for summer break. As kids rack up points, they can enhance their frogs. There are ten places to visit – from frog’s swamp to the jungles and mountains. Each level has new insects, both real and pretend. If your frog eats a fly with blue sparkles, everything freezes, allowing time for more points. Create a FlyBurger! Catching flies in the dark is a little trickier 🙂 Check out the videos below and the ease of use for your youngest tots, on just a few of the levels The colorful graphics and animations will keep kids coming back for more bugs. This app is ad free and kid-safe. The first version of the game. I had made it in one day and it included the frog itself, single type of flies and only one level. When I had started testing it, I didn’t even notice how fast time had passed. After that, I stuck with this idea. The green frog, it was love at first sight.